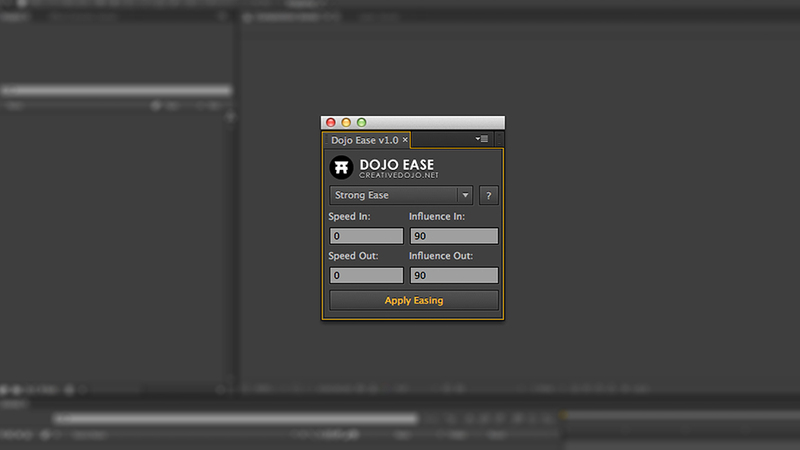 Dojo Ease is an After Effects script that allows you to bulk modify the speed and influence values of multiple keyframes at once. You can manually enter in speed/influence values to automate, or use the available presets to quickly get the results you’re after. If you find yourself doing repetitive tasks in the graph editor or using very similar values, you can automate the whole process using Dojo Ease. The script is simple and compact, allowing you to dock it anywhere and access it with no issues. I originally developed a basic version of the script for my own personal use, but decided to revamp it for public use after Duncan Major (@duncanmajor) requested such a script. It’s unfortunate that Adobe doesn’t make it easier to access the speed/influence properties of keyframes without having to double click individual keyframes to edit. Hopefully this script will be useful for many of you and will aid in your easing workflow. This script is a free script under the “Name Your Own Price” platform, so if you find this script useful, feel free to donate whatever amount you’d like. You can download Dojo Ease and/or donate here. If you’d rather skip the store procedures and download it immediately, you can unlock the download link by clicking on one of the social lockers above. If you have any suggestions for new features or modifications, or if you want to report bugs, let me know in the comments below! Had a question, does it work with the newest update of AE CC (October 2017)? I would love it if you could have multiple keyframes parameters. ie. Different parameters for the outgoing and incoming keyframe.